Recently I visited Srilanka to attend the ‘Expat Forum’. While I was in Colombo, I spent most of my time driving within the city streets and the streets outside Colombo, mainly within the Colombo South suburbs. I noticed that there are opportunities to improve road safety, driver skills and the public transport system within the existing road framework without spending huge sums of money. With this in mind, here are some proposals to improve road safety, public transport system and driver skills on Sri Lankan roads. While drivers in Sri Lanka have vehicle skills such as controlling the vehicle, their knowledge of road rules is minimum and they are a potential hazard for other road users. This is the reason for the high percentage of accidents occurring in Sri Lanka. Most of the drivers are issued with driver’s licenses without obtaining required driver skills and use illegal avenues to obtain the license. It will not assist merely to blame the system and the crooks within the Department of Motor Registry. It won’t solve the problem. I would suggest implementing a ‘One Day Driver Awareness Programme’ for every driver and making this requirement mandatory for the renewal of Motor Vehicle Licenses each year. This can be implemented at district level and will create more jobs. The fee for the renewal of license can be increased accordingly to compensate the expenditure associated with the day course. This will help to improve driver skills and decrease road accidents. The establishment of school zones has been adopted by leading western nations in the world. Most school zones have maximum speed limits, speed calming devices to slow vehicles down and appropriate signs with flashing lights to warn motorists about the zone. Installation of 30km/h yellow coloured signs with flashing lights at the each end of identified school zones. Solar power can be used to power the flashing lights. UNICEF could be approached to obtain funding. Construction of speed calming device such as thresholds at the either end of the zone to reduce the speed. Promote “Go 30 for me” slogan by school kids appealing to drivers at all ages. More traffic police patrols within the zones for policing the implementation which will provide income for Colombo Municipality to fund the campaign. This approach will definitely reduce the number of accidents and make roads safer for school children. I appreciate the effort of the Minister for Transport Dallas Allahapperuma and his failed “Park and Ride” service to encourage people to leave cars and catch the bus. The idea and the intention were good. However it was badly implemented and Minister was poorly advised. I was not surprised that this failed because the travel time by bus was much longer than the travel time by car for the same journey. This was not studied by the traffic planners prior to the implementation of this campaign. The reason may be the lack of experience and understanding of the subject by the local traffic planners. Western carriageway of Galle Road (north-bound) from Roxy Cinema, Wellawatte to Bambalapitiya to be transformed into a two-way Transit Way for buses including three-wheelers and other hired cars. The kerbside lane on the western carriageway (north- bound) of Galle Road from Bambalapitiya to Colpetty should be transformed into a Bus Only Lane. Installation of bus-priority traffic lights at Bambalapitiya and Colpetty junctions. n	Establish one-way traffic on the eastern carriageway of Galle Road from Bamabalapitiya to Wellawatte Roxy Cinema (south-bound) for all traffic excluding buses and three wheelers. Transform Marine Drive from Wellawatte Roxy Cinema to Bambalapitiya for one way traffic going north including three-wheelers and other hired cars. Transform one way traffic on number of cross roads between Marine Drive and Galle Road from Roxy Cinema, Wellawatte to Bamabalapitiya for vehicles wanting to go west to east or east to west. Introduction of traffic restriction on most of the cross roads between Marine Drive and Galle Road by installation of no entry signs and construction of culs-de-sac. Introduction of left-turn only signs on cross roads on the eastern side of the Galle Road to accommodate the vehicle that wants to enter Galle Road except at certain intersections with Galle Road. Installation of traffic lights at certain roads intersections on the eastern side of the Galle Road to accommodate the traffic when seeking to turn right onto the Galle Road from the cross roads on the eastern side of Galle Road. Introduction of No Parking on Galle road between 6.00 am and 7.00 pm. It is necessary to install appropriate signs to notify the motorists. Appropriate signs to be installed at all intersections. Line marking to be done on Galle Road including all cross roads. This approach will shorten the travel time and encourage people to leave vehicles and catch the bus. This will lead to fewer vehicles on the road during the peak hours and improve the air quality in the city. It is very difficult to eliminate accidents completely from roads. However, introducing certain methods to combat speeding or changing the road geography at identified ‘black spots’ would minimize the accidents to acceptable levels. The RDA or the Local Road Authority (Local Council) should identify all the black spots (accident prone areas) on major roads after studying the pattern of all deadly accidents for the last five years. Then prioritize the list depending on the availability of funding. The solution could be the construction of traffic separating barriers to a certain distance or improving the sight distance on both side of the single carriageway or widening the road pavement to accommodate the overtaking lane. This can be achieved with a minimum budget and will improve the road safety, minimize the road carnage and save lives. I am very disappointed with the standard of our shopping streets. The condition of landscaping in our town centres is appalling. The problem in Sri Lanka is simply that the engineers are trying to perform the duties of other professionals. The other problem is their authority over other professionals. It is alright in the good old days. The world is changing. They should know that there are other professionals in the industry who are more competent than engineers in their own field. I visited a few shopping streets in the City of Colombo, Nugegoda, Maharagama and Dehiwela. The lack of access for pedestrians is unacceptable for a modern city. There is no street beautification work in place to make City of Colombo beautiful and attractive. 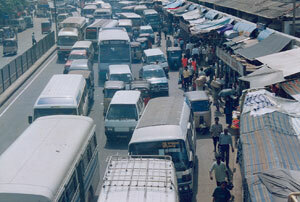 The Duplication Road from Colpetty to Bambalapitiya should be the shopping hub of the City of Colombo. The city should welcome the big businesses to the area to open departmental stores and mega shops. The Duplication Road consists of four traffic lanes going south. The four lanes should be narrowed down to three to accommodate wider footpath for the benefit of shoppers. The Colombo Municipality can rent part of the footpath frontage to restaurants to have open air eating places during day and night. The beautification of footpaths can be done in discussion with restaurant owners and other shop owners. The funding for beutification work can be shared between the shop owners and the Council or the government. The construction of a median island with native plants gardens and installation of flag posts on Duplication Road can make the difference. The paving of footpaths with modern-day coloured pavers will add the extra feature into the city footpaths. The construction of raised pedestrian crossings will slow down the traffic and improve pedestrian safety. Construction of a wider footpath to accommodate the pedestrians. No bus stops between High Level Road and the railway line. Footpath free of street vendors. Parallel parking on one side of the street. Street beautification works on footpath. Installation of flag poles on footpath. Construction of raised pedestrian crossings at both ends of Church Street. Installation of new bus stands outside W.G. Gunewardena Shop. Parallel parking on kerbside lanes on both side of the road between the railway line and Nawala Road. The paving of footpaths with modern-day coloured pavers will add the extra feature into the footpaths. The market building and the carpark need a facelift. I suggest installing glass cladding for the building frontage. (The writer is a Civil Engineer and worked in England and Australia for almost 25 years as Works Manager and Senior Executive in the fields of roads, business centres, drainage and traffic. He is presently employed as Senior Project Manager, Roads and Traffic Authority, NRW, Australia. He could be reached at jajayaweera@hotmail.com).